Wearing classic pieces in today's outfit post: a black camisole from Cebu-based clothing shop, Let's Stylize; a midi length leopard pencil skirt; a quilted flap bag in caviar leather; and glitter Pigalle red bottoms. 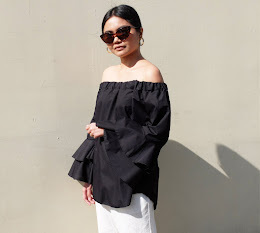 If I'm not decked out in bardot tops, strappy camisoles are my go-to options for everyday wear. I love buying them in different colours because they're so easy to style. You can pair them with skirts for a feminine look and alternatively, you can team them with culottes for a more casual feel.